Are there any benefits of infusing fruits instead of simply squeezing them into water? Yes! In this post we use half an orange in each type of preparation for comparison. 1) Flavor. You would assume these two drinks would taste the same, but the difference is drastic. 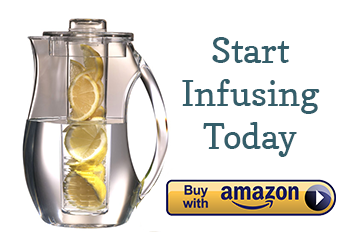 The infused water derives flavor from the rind and tastes bright and tangy, even after infusing for just 15 minutes. The juice, on the other hand, tastes watered down and plain. 2) Appearance. Let’s face it, the infused water is prettier than the juice, which is important because you eat and drink with your eyes. If a beverage looks colorful and healthy, you will be more inclined to drink it, which will help to keep you hydrated. 3) Calories. While fresh juice is nutritious, it is also packed with calories and natural sugars. Infused waters has far less calories because the fruit remains intact and you do not actually eat it. Also, less fruit is required make an infused water than to make a glass of fresh juice or a smoothie. For instance, did you know that a standard glass of fresh squeezed orange juice contains the juice of 4 oranges or over 240 calories? On the other hand, three orange slices in an infused water only contributes 31 calories (but likely even less than that). 4) Preparation. I used to drink juice every day using a Green Star Juicer, but I stopped because it took too long to clean and I could not keep enough fresh produce around. With infused waters, I just look at what is in my fridge and improvise. 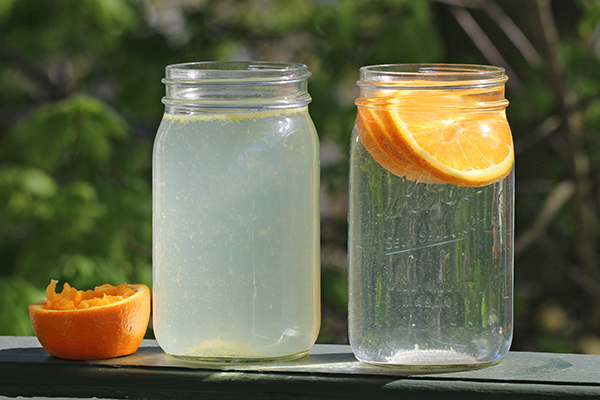 A simple Lemon Infused Water takes seconds to make and can add immense flavor to your day. 5) Hydration. Staying hydrated is essential to staying healthy, and infused waters make staying hydrated easy. While fresh juice does provide hydration, it is a one time drink whereas you can drink a batch of infused water all day long, especially if you make a large pitcher. Is it okay to squeeze juice into your infused waters? Of course! 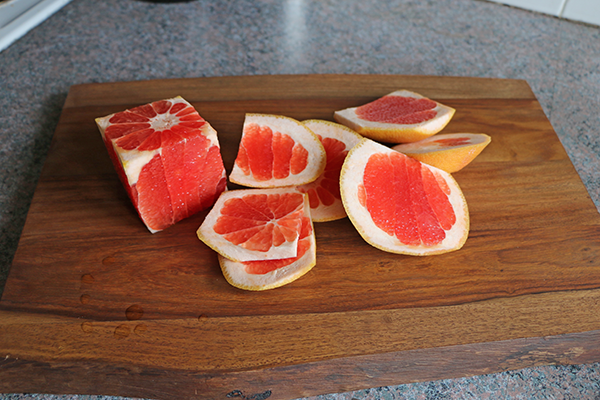 I often squeeze the remnants of citrus rind that I have cut off, such as in the picture below. It does not make sense to waste fruit, plus a little squirt of juice does add flavor. So, in summary, don’t fear fruit juice, but do use it in moderation if you are going to use it at all in infused waters. Cheers! I just started making fruit infused water and am so happy I found your website. I work outside in South Carolina so keeping hydrated as it heats up is a must. I can’t wait to stock up on some fruit and try some of your recipes! They all sound amazing! hi there, I am from sunny Singapore and chanced upon your website while i was “googling” for more information bout infused water. I started months ago every morning with half squeezed lemon juice diluted with warm water and a teaspoon of ginger powder. then i read about making your own alkaline water with infused lemon water and a teaspoon of himalayan pink salt to “mineralize” it. i even threw in cucumbers as well for good measure. is there a better among the two – squeezed lemon juice warm vs infused cold? or i should drink myself silly with both combi? lol. Fabian, thx for the information. I am new to infused water as well as I’m trying to break my addiction to coffee! 🙂 I did not know you could buy ginger powder nor that you could make your own alkaline water by simply adding himalayan pink salt. Alkaline converting machines are expensive so thx for the extra bit of info! I’ve been trying infused water the last few days but it mostly tastes like plain tap water, which I can’t stand. Any tips, like water to fruit ratios? Definitely more fruit then and sliced thinner, I’d guess. Also a little maple syrup won’t hurt. I would recomend using more fruit and letting the fruit infuse the water for longer. Hope this helps! If you want more juice, microwave the fruit for 15-20 seconds to produce more juice. I agree, 1-2 thin slices adds a subtle taste, though visibly attractive. I usually fill near to top of the the glass/jar/container loosely w thicker chunks or to 1/2 way mark with thinner chunks/slices an let sit for at least an hour. the flavor is quite mild, but if ice cold is very refreshing. Mint sprigs to nearly any of the concoctions livens it up immensely. I appreciate all the helpful information about the ingredients you use and their respective health benefits. But I’m just wondering if you actually get the health benefits from them, since you’re not actually consuming it, but rather only a small amount of the juice or whatever? I have been experimenting in work for about a month, I am using sparkling water in 2 ltr bottles. I cut slices of Lemon, Lime, Kiwi and peel root ginger and put in in cubes. I prepare 3 bottles at a time and leave them in the fridge and drink one full one a day. i was once almost 10 cups of coffee a day, now I have one in the morning before work and infused water only all day. I have to say i feel and look healthier. I do have a question thou, is the sparkling water any worse for you and how long would you be able to leave a prepared bottle before drinking. hi. try vegetable fusion,too. 2 slices of lemon, 3 slices of ginger, 3 leaves of ashitaba, and 2 slices of cucumber. mixed in 2 liters of water….refreshing and good energizer than coffee. Is it okay to leave lemon infused in water for a week? New at infusing how many days can I readd water to the fruits in my jug (16-20oz) before I throw them away? I WOULD LIKE A SMELL,,, DOES HE SHARE? ? I did NOT say that. I don’t lie. You are nasty for that comment keep your personal nasty self to yourself we dont ask you for that!!!!! isnt’ this a bit personal, this is about health ..
Over 240 cal? this is not true for orange juice. The 240 cal you mentioned includes fibre!!! Hi, Kel. Oranges contain about 40 calories a piece, so if you are squeezing the juice from the orange, you will be consuming 40 calories. There are about 4 oranges in glass of fresh squeezed orange juice, so those calories add up pretty quickly, as well as natural sugars. Fiber, unfortunately, does not detract calories nor is it included in many commercial juices. Four oranges at 40 calories each would be 160 calories. If you added sugar, calories go up. Of course, the size of the orange also makes a difference in the number of calories per fruit. The problem with fruit juices is actually that the fiber is broken down to be able to turn it into juice since that is what keeps it solid. So when you drink juice it is mostly sugar you’re drinking. It’s ok every once in a while but drinking it too ofter is just like drinking soda. I like to put limes in my water bottle overnight, and since doing this I have noticed I have more energy. I carry my water with me through the school day sipping on it occasionally. The natural sugar wakes me up and helps me focus. Also, the constant hydration keeps me from feeling hungry in second period. take half cut lemon, squeeze it a little into 1 ltr water. u need to squeeze only a little so that u can make lemon inside out and keep in water. then add sugar and salt. tighten the lid. shake well. Cumin seeds infused water is good for digestion. Thanks, I’m going to try this.. I am wondering if i can use my dried herbs in my water, or is fresh the way to go? Are you ppl so afraid of calories ????? While fruit infused water is good , fruit juice without any additives is any day far far better. and these benefits while miniscule compared to juice fade away very fast as the fruit starts getting waterlogged, it goes bad and some foolish ppl may just be drinking more germs / fungus rather than having fresh juice or fresh fruit. It is very beneficial to drink detox water than normal water. It helps for weight loss. Thanks for sharing this information. I have infused dried fruit for years. The calories are a bit more than fresh fruit, but I also use the water for baking instead of sugar, and will then simmer the used fruit down to a compote and add spices. It is far better than store bought jam.